Drivers will be able to go a little faster starting this afternoon on a portion of the 215 beltway. 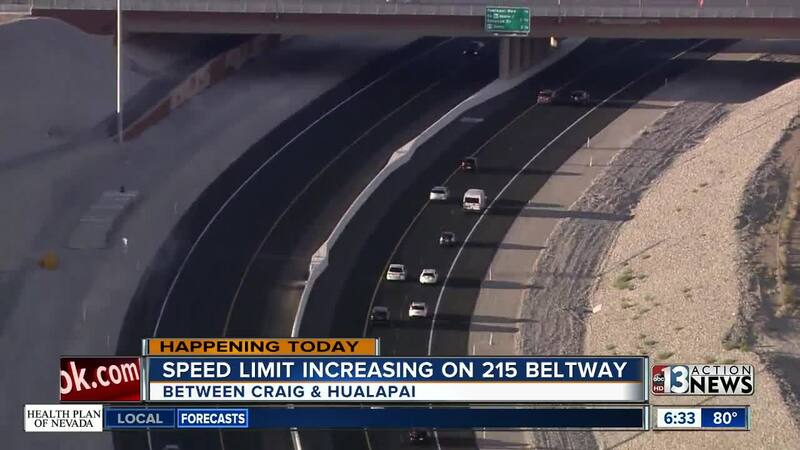 The speed limit is being increased from 45 to 65 mph on the beltway between Craig Road and Hualapai. Drivers will be able to go a little faster starting this afternoon on a portion of the 215 beltway. The speed limit is being increased from 45 to 65 mph on the beltway between Craig Road and Hualapai. The increase marks another milestone in a major project happening in the northwest. Intermittent closures of travel lanes and/or the Lone Mountain Road and Ann Road off and on ramps can also be expected on this newly constructed section of the 215 Beltway as cleanup and punch list work on this project is accomplished over the next 30 to 60 days. Las Vegas Paving is the contractor on the project. The 215 Beltway Craig Road to Hualapai Way project includes turning three miles of the beltway into a full freeway, new floodwater detention basins and other flood control improvements, an extension of the western Beltway bicycle/pedestrian trail, new highway interchanges at Lone Mountain and Ann roads, and a bridge carrying Centennial Parkway over the highway.